I make the last one of the Saratoga meet count! Coming off the heels of a crushing beat in the Travers, it would be a nice feeling to hold a winning ticket on the final Saturday of racing from the Spa. This is no easy sequence, with large fields and two Grade I races sandwiched in. A full field sprinting on the grass isn’t exactly the easiest way to start the Pick Four. Orient Harbor (#1) and Ballerina Belle (#8) are the top two on paper, but there are concerns for both horses. Orient Harbor has to overcome the inside post, while Ballerina Belle is consistent but after all she’s 1-for-9. Still, they appear better than this bunch and are a must use. Additionally, Scatcapade (#7) coming out of the Coronation Cup is a backup play. These three won’t offer much value, but we will look for some bigger prices in other spots. The Forego revolves around Clearly Now (#8). If he runs like he did in the Belmont Sprint, this race is clearly over. However, he is making his Saratoga debut and there’s a chance he could bounce coming off such an impressive race. The other major player is Palace (#6). He was terrific in the Vanderbilt, but stretching out an extra furlong against tougher horses – at 3-1 morning line I might add – isn’t for me. Big Business (#2) is a perfect 3-for-3 going seven furlongs as David Jacobson looks to upset the Forego for the second straight year. I would expect Junior Alvarado to have him forwardly placed. Weekend Hideaway (#9) has won his last two and attracts Javier Castellano. Three wins in four starts at the Spa, he is more of a horse for the course play. Horses like Capo Bastone (#1) and Vyjack (#3) have every right to improve, but I’ve given up trying to figure them out. Well..I am finally on the Eric Guillot train. Moreno (#4) proved me wrong in the Whitney as he wired the field. The difference in the Woodward is the target is on his back. That doesn’t change the fact he will be on the lead at Saratoga where he’s been tough to pass.Itsmyluckyday (#2) adds blinkers and is one of the few horses from the Whitney that did any running. He should be up there with Moreno in the early going. In case Moreno and Itsmyluckyday duel each other to defeat, there are some others who deserve consideration. Zivo (#6), winner of six straight, would love a quick pace to close into. I also will throw Norumbega (#7) in the mix. He adds blinkers, switches to Castellano, and likes running around the Saratoga oval. Outside of Moreno and Itsmyluckyday, I’ll pass on the horses exiting the Whitney. In the finale, I spread out with the five most logical horses. European import Belisarius (#7) has a solid five furlong work on the turf as he prepares for his American debut. Iron Power (#8) likes the lead but going one mile and three sixteenths, Irad Ortiz Jr may want to rate.Alarmed Ndangerous (#10) is a nice price at 12-1 morning line with some back class for Linda Rice. Make a Decision (#11), also hailing from the Rice barn, reunites with Cornelio Velasquez. Special Agent (#12) has experience running longer on the grass and is in the hands of Castellano, who is on his way to winning the jockey title for the meet. 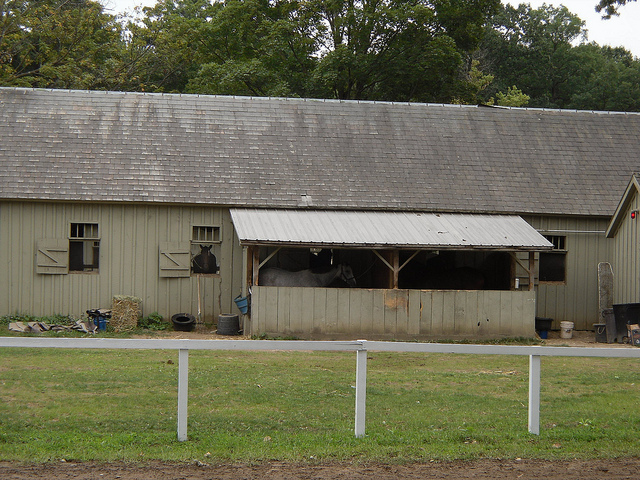 Image: Doug Kerr, “Saratoga Race Course.” Copyright 2010.